PowerCap® Active™ IP (Patent Granted) is a lightweight, firm fitting, ergonomically designed positive pressure respirator, designed to protect the user from dust and most airborne particulate pollutants to EN12949+A2 TH1P. PowerCap® Active™ excels in very dusty environments within light industry (machining and milling), agriculture (livestock, poultry farming, grain silos), landscaping, and food processing. 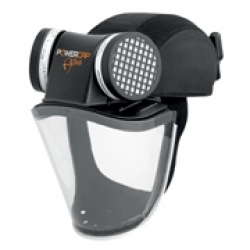 Powercap® Active™ IP incorporating bump cap protection and impact faceshield with high protection against flying particles. Complete with faceshield, two TH1P filters, one battery pack, and one charging dock. Conforms to EN 166, EN812+A1, EN12941+A2 TH1P. Powered Air Protection to EN12941+A2 TH1P gives a cooling, comfortable supply of filtered air at 160 litres per minute eliminating breathing resistance and visor misting. Impact Eye & Face Protection Eye and face impact protection to EN166 1B, ideal for working in environments where there is a danger of flying particles - peel-off covers available.